Madurai : The Madurai City Corporation is set to receive a special award from the Centre as part of the Swachh Bharat Abhiyan. The Meenakshi Sundareswarar Temple has been adjudged best ‘Swachh Iconic Place’ in India as on October 1. Ten spots were identified by the Central Government as part of the ‘Swachh Iconic Places’ initiative earlier this year. Madurai District Collector K. Veera Raghava Rao and Corporation Commissioner S. Aneesh Sekhar will receive the award on October 2 from Uma Bharati, the Minister for Drinking Water and Sanitation. Dr. Sekhar said the Meenakshi temple project focuses on cleaning the periphery of the temple. It is in the early stages and is slated to be complete by March 2018. The project is estimated at ₹11.65 crores and has been sponsored by Bharat Petroleum Corporation Limited as part of their Corporate Social Responsibility fund. “We have been awarded for the swift progress that has been made until now. We are proud that we have been chosen among the other 10 iconic places,” he said. The Madurai Corporation has placed several bins at a distance of 50 metres along the Chithirai streets. A total of 63 compact bins (for biodegradable and non-biodegradable waste) have been placed and four compactor trucks do the rounds around the temple premises. There are 25 e-toilets and 15 water ATMs for tourists to use. There are two road sweepers and battery operated vehicles specifically purchased to clean this stretch. 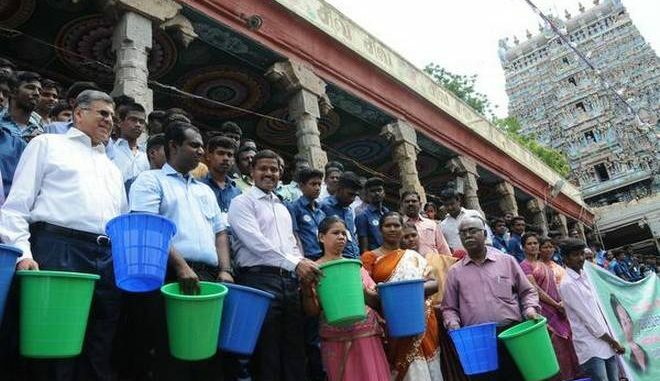 The target before March 2018 would be to make Chithirai, Masi, Avani Moola Streets and Veli Streets – the four concentric squares around the temple – 100 per cent plastic free, according to the Commissioner. He also stated that ₹25 lakhs would be invested in the maintenance and upkeep of the Meenakshi park between east and north Chithirai streets. “Five traffic islands would be strategically placed for beautification purposes. A mini sewage treatment plant too is in the pipeline. The treated water will be used for gardening purposes,” he said. Vendors around the temple too seem to be overjoyed by the news. They said that they have taken special efforts to stop plastic dumping on the roads.